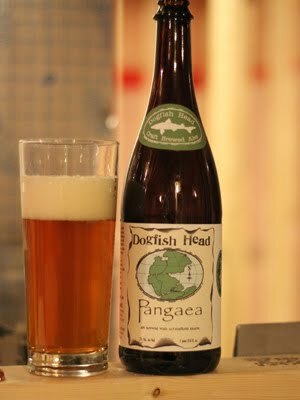 "Brewed with ingredients from each and every continent, Pangaea is a slightly spicy ale with a mouthful of rich flavors. It's a great food beer. Pangaea comes in 750ml bottles." Pours a nice tangerine orange / yellow. Two and a half fingers of fluffy white head crown the beer. Plenty of effervescence streaming from the glass. Wonderful hints of ginger and spice. Some bready sweetness. Not a pungent beer, more floral and pleasantly fragrant. The ginger and spice come through nicely. Hints of nutmeg, coriander and cloves fill out the complex nose. Some dried citrus peel also present. While there is some sweetness, it is more of an earth, honey type flavour. Not overly sweet. This is definitely a celebrational ale. Another solid beer from this very popular brewery. Sam's idea of "bringing the world together" with a unique concept of having ingredients from all seven continents is successful in its execution. This would be a wonderful beer to enjoy with a Thanksgiving or Christmas dinner. Not too heavy, complex in flavours and in that wonderful Dogfish Head 750mL bottle. It makes enjoying this an occasion. Solid beer, solid B+ to A-.